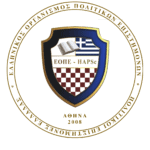 Considering the importance of transparency, both in terms of the decisions made and outcomes of any action of the association, this part of the site is used for the publishing of the official documents of HAPsc, as it has been decided by the President of the Association, Mr Symeon Sidiropoulos and the Board of Directors. More specifically, this is the place where anyone can access the documents that make up the Statute of the HAPSc, the decisions of the General Assembly, the electorate, the Board of Directors and the President. Documents including personal information are not published for obvious reasons.